May is a great time to visit the gardens. Early May sees the end of the magnificent magnolia display in the rock garden and cherry blossom around the main lawn. May also sees the arrival of azaleas and rhododendrons in profusion. Many other shrubs flower at this time and there are alpines and early herbaceous plants and bulbs making a show at ground level too! An ideal route at this time leaves the terrace past the parrot cages and drops down into the alpine yard for the spectacular Wisteria wall (1) and Rosa banksiae (2) and plenty of alpines including iris and paeonies. 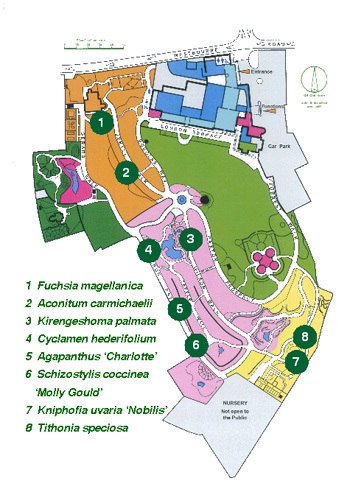 Follow the path from the lower alpine yard to the fountain and turn down into the rock garden for Iris sibirica (3) around the pool and Emobthrium coccinuem (4). Take the gravel path down between the rhododendrons (5) which will be coming into bloom. You will reach the bog garden where other-worldly Gunnera manicata (6) will be flowering and deploying its massive leaves. Go across the tarmac path into the fern garden to look at the amazing ‘bishop’s crosiers’ of the unfurling tree fern fronds (7). Here you can loop around the herbaceous grass and trials area to see the bearded irises. Return uphill slowly via the Wilson walk and look for a medium sized tree in full flower – this is the Hupeh cherry (8) all the way from China introduced by our most famous horticulturist Ernest ‘Chinese’ Wilson. Many other flowering shrubs will be looking good along this path as well. Turn right at the fountain and walk alongside the lawn. Look out for the young foliage and small flowers of the acers and cherry blossom as you walk back round to the terrace. Don’t forget the terrace tea shop for a well earned cup of tea and the shop at the gardens where a wide range of plants are available for you to take home. Download the text and map for this Seasonal Walk.